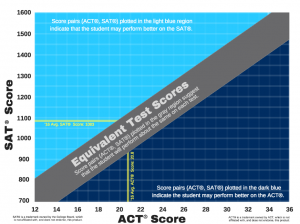 Which Standardized Test is Right for You? If, however, you don’t have a spare 6 or 7 hours to devote to taking both full-length tests, you can make an educated and informed decision based on the fundamental differences between these two options. Take this quiz below to figure out which test is right for you! I am stressed out by time limits for tests or tasks. I do NOT always need a calculator to do basic math problems. Now, add up your points!